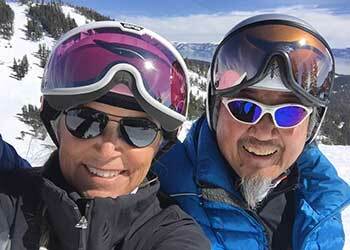 Skiing in Nevada – Miracle March? March Madness? Miracle March? March Madness? 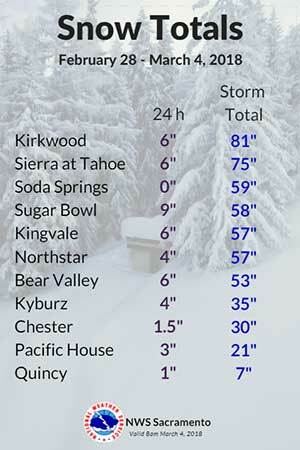 These were terms that locals used this past month when the Storm Door finally opened and Mother Nature brought winter back to Lake Tahoe and northern Nevada… Gotta hand it to Punxsutawney Phil! And, as I write on this first full day of Spring, a Winter Storm Warning is posted with the caveat that this system includes an Atmospheric River (i.e. Pineapple Express to bring much needed rain to our valleys and snow at higher elevations). How much more snow will we get before the end of the month? Stay tuned, as it’s not over until it’s over or until the Fat Skis sing! The storm had subsided as well as the winds and resorts were trying their best to mitigate avalanche danger on their slopes, clear parking lots and prep lifts to open… There were unbelievable lines waiting for lifts to open and once opened, almost despicable powder skiing frenzies were happening. The saying is “No Friends on a Powder Day”. But, it doesn’t mean blatant disregard for common courtesy or for safety; or being outright rude to others. I was amazed, disappointed and out right embarrassed to see this kind of behavior from the powder hungry hounds racing to the lift maze, pushing, shoving, squeezing to get in line. All so one can claim first chair or first 20 chairs. First run down this run or that run; bragging rights, Go Pro Videos to prove it and all the other reasons to fight for powder turns… Granted, there have been very few fresh deep powder days offered up this year and maybe the pent up frustration of doing so showed its ugliness after this storm. 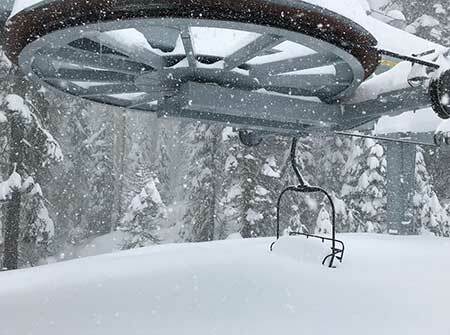 On March 2, there was an inbound avalanche at Squaw where some skiers were caught, but all were found and dug out safely. The next day, a similar avalanche occurred at Mammoth catching several skiers, but all were found safe. Back Country Avalanche Warnings were posted and thank goodness, I didn’t hear of anyone getting caught, injured or needing to be rescued. There were a bunch of stupid idiots that ducked ropes or skied out of bounds that got in trouble and needed search & rescue teams to come save them. Is it the powder hound mentality that skiers & snowboarder think it’s okay for them to ski out of bounds without regards their own safety and the safety of others that may have to rescue them? Not sure what is driving this mentality on powder days, other than ego, and don’t see this changing. By afternoon the sun and warm temperatures started to affect the snow surface on the backside, but I had enough wax on my skis to keep ’em sliding downhill. Heavenly Mountain Resort – Nevada side was my next ski day and couldn’t believe everything was open… most of open glades & trees, North Bowl, Milky Way Bowl and Mott & Killebrew Canyons. Snow surface again was perfect for cruising and carving turns. March 12 skiing Heavenly with the clouds covering the Lake below. 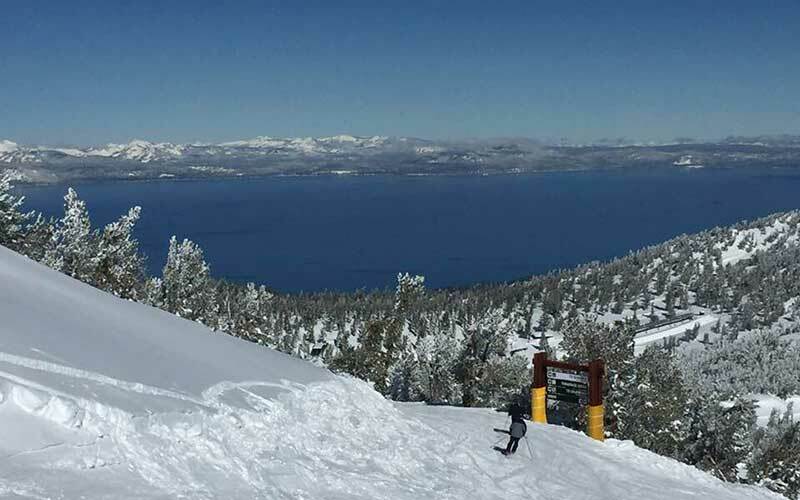 With a break between storms, I was fortunate to get up to Heavenly on my birthday, March 18, and enjoyed a BLUE-TI-FUL day on the mountain… And, yes there were definitely lines to board lifts and lots of folks enjoying the fresh snow and sunshine. Easter Sunday is traditionally the cut off of the ski season and with it coming early on April 1, the remaining of the ski season will be in question… Some resorts will stay open till April 8, to accommodate Spring/Easter break families; some have already announced closing April 15; And, some others may extend past this date… And very few resorts will remain open after April 22. Look for some fun events celebrating spring on the mountains… Costume days, Retro Ski Fashions & Vintage equipment days, endurance competitions and fun events like the Dummy Downhill and Pond Skimming Contests are also a big hit… Resorts continue to get creative in attempting to offer another reasons why you should continue to ski past Easter Sunday. I have been associated with the Pioneers of Freestyle Family since 2011. I was not a freestyle skier, but was a former photographer and announcer of freestyle events in the mid 70’s and in the 90’s. I had also produced the Coors Light Freestyle Bump Series at Sierra at Tahoe in the mid-late 90’s and have associated with the freestyle skiers of 70’s ever since the beginning. For the past 8 years, I have assisted the U.S. Ski & Snowboard Hall of Fame by participating in their nominating and voting committee to get Freestyle & Free Ski /Extreme Skiers inducted into the Hall of Fame. Glen Plake, Daron Rhalves, Scot Schmidt, Chris Davenport, Wayne Wong, John “JC” Clendenin, Bob Salerno, Genia Fuller, Marion & Ellen Post to name a few have recently been inducted. This year, Airborne Eddie Ferguson and Herman Gollner of freestyle competition fame of the 70’s; as well as the late, Steve McKinney who was instrumental in creating and promoting Speed Skiing; Plus, Tahoe local, Shaun Palmer, pioneer of snowboarding, and others will be recognized for their accomplishments and contributions to the sport of skiing or snowboarding and will be Inducted as honored members of the U.S. Ski & Snowboard Hall of Fame. The Induction Dinner is slated for the evening of April 14 at the Resort at Squaw Creek and will be emceed by Olympic Gold Medalists, Jonny Moseley. I will be hanging up the skis after this event and turning my attention to other outdoor activities and especially bicycling… Bicycling has become a huge component in Nevada tourism marketing and as a member of the local organizing committee for the Amgen Tour of California; Event Director of Bike the West; Founder Father of the Alta Alpina Cycling Club; Charter Member & VP of the Lake Tahoe Bicycle Coalition; TAMBA & Muscle Power Member, and more… I will be covering road biking and mountain biking activities, events, fun rides, bicycle related opportunities, information updates including bicycle advocacy and more. Time to pump-up my tires and see you down the road!